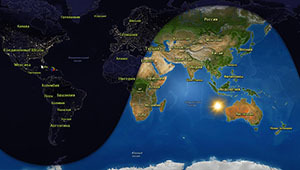 Sun-Earth line, an equatorial component was present. A glancing blow from this partial halo CME is possible and can be expected early on April 3. Both the C7.6 flare in AR 2014 and the M1.4 flare in AR 2014 had eruptions associated with them, but preliminary analysis with STEREO COR2 ahead seems to indicate that they had a relatively small angular width and are therefore not expected to become geoeffective. The solar wind speed is steady at 400 km/s with the magnetic field at around 4 nT. Geomagnetic conditions are quiet to moderate, with Kp not above 2, while the local K Dourbes reaching 3. This entry was posted in Our observatory, Sun online and tagged C-class flares, Coronal Mass Ejection, M-class flares on March 31, 2014 by sponli. What is the furthest known object in our Solar System? The new answer is 2012 VP113, an object currently over twice the distance of Pluto from the Sun. Pictured above is a series of discovery images taken with the Dark Energy Camera attached to the NOAO’s Blanco 4-meter Telescope in Chile in 2012 and released last week. The distant object, seen moving on the lower right, is thought to be a dwarf planet like Pluto. Previously, the furthest known dwarf planet was Sedna, discovered in 2003. Given how little of the sky was searched, it is likely that as many as 1,000 more objects like 2012 VP113 exist in the outer Solar System. 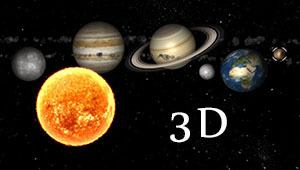 2012 VP113 is currently near its closest approach to the Sun, in about 2,000 years it will be over five times further. Some scientists hypothesize that the reason why objects like Sedna and 2012 VP113 have their present orbits is because they were gravitationally scattered there by a much larger object – possibly a very distant undiscovered planet. This entry was posted in 2014, Astronomy Picture of the Day and tagged dwarf planet on March 31, 2014 by mari. This entry was posted in AstroPhotography of the day and tagged Monkey Head Nebula, NGC 2174, Orion on March 31, 2014 by mari. The strangest moon in the Solar System is bright yellow. This picture, an attempt to show how Io would appear in the “true colors” perceptible to the average human eye, was taken in 1999 July by the Galileo spacecraft that orbited Jupiter from 1995 to 2003. Io’s colors derive from sulfur and molten silicate rock. The unusual surface of Io is kept very young by its system of active volcanoes. The intense tidal gravity of Jupiterstretches Io and damps wobbles caused by Jupiter’s other Galilean moons. The resulting friction greatly heats Io’s interior, causing molten rock to explode through the surface. Io’s volcanoes are so active that they are effectively turning the whole moon inside out. Some of Io’s volcanic lava is so hot it glows in the dark. This entry was posted in 2014, Astronomy Picture of the Day and tagged Io, Jupiter, Jupiter's satellite on March 30, 2014 by mari. As dawn broke on March 27, the center of the Milky Way Galaxy stood almost directly above the European Southern Observatory’s Paranal Observatory. In the dry, clear sky of Chile’s Atacama desert, our galaxy’s dusty central bulge is flanked by Paranal’s four 8 meter Very Large Telescope units in this astronomical fisheye view. Along the top, Venus is close to the eastern horizon. 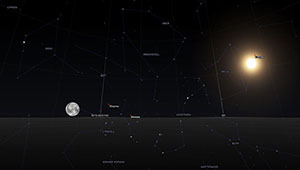 The brilliant morning star shines very near a waning crescent Moon just at the edge of one of the telescope structures. Despite the bright pairing in the east, the Milky Way dominates the scene though. Cut by dust lanes and charged with clouds of stars and glowing nebulae, the center of our galaxy sprawls across the darker zenith even as the deep blue sky grows brighter and buildings still glint in moonlight. This entry was posted in 2014, Astronomy Picture of the Day and tagged Milky Way on March 29, 2014 by mari. The Triangulum Galaxy is a spiral galaxy approximately 3 million light years (ly) from Earth in the constellation Triangulum. With a diameter of about 50,000 light years, the Triangulum galaxy is the third largest member of the Local Group of galaxies. It may be a gravitationally bound companion of the Andromeda Galaxy. Triangulum may be home to 40 billion stars, compared to 400 billion for the Milky Way, and 1 trillion (1000 billion) stars for Andromeda. The disk of Triangulum has an estimated mass of (3-6) × 109 solar masses, while the gas component is about 3.2 × 109 solar masses. Thus the combined mass of all baryonic matter in the galaxy may be 1010 solar masses. The contribution of the dark matter component out to a radius of 55 kly (17 kpc) is equivalent to about 5 × 1010 solar masses. This entry was posted in AstroPhotography of the day and tagged M33, Triangulum Galaxy on March 29, 2014 by mari. Image Credit: NASA, ESA, CXCSpiral galaxy ESO 137-001 hurtles through massive galaxy cluster Abell 3627 some 220 million light years away. The distant galaxy is seen in this colorful Hubble/Chandra composite image through a foreground of the Milky Way’s stars toward the southern constellation Triangulum Australe. As the spiral speeds along at nearly 7 million kilometers per hour, its gas and dust is stripped away when ram pressure with the cluster’s own hot, tenuous intracluster medium overcomes the galaxy’s gravity. Evident in Hubble’s near visible light data, bright star clusters have formed in the stripped material along the short, trailing blue streaks. Chandra’s X-ray data shows off the enormous extent of the heated, stripped gas as diffuse, darker blue trails stretching over 400,000 light-years toward the bottom right. The significant loss of dust and gas will make new star formation difficult for this galaxy. A yellowish elliptical galaxy, lacking in star forming dust and gas, is just to the right of ESO 137-001 in the frame. This entry was posted in 2014, Astronomy Picture of the Day and tagged ESO 137-001, Triangulum Australe on March 28, 2014 by mari.